Here she is, ladies and gents: A little project I’ve been wanting to do since our daughter was born. It only took me a billion days to decide that I could spend a measly hour doing it…. Until now, my daughter’s headbands have been folded very neatly (read: stuffed haphazardly) in a pocket of our baby clothes door hanger. TIP 2: A thinner fabric will allow the box lid to easily go back on, then you can use the inside. Okay, let’s talk about the wooden pedestal thing for a sec. Cause seriously, I’m not super sure where everyone else is getting theirs from. 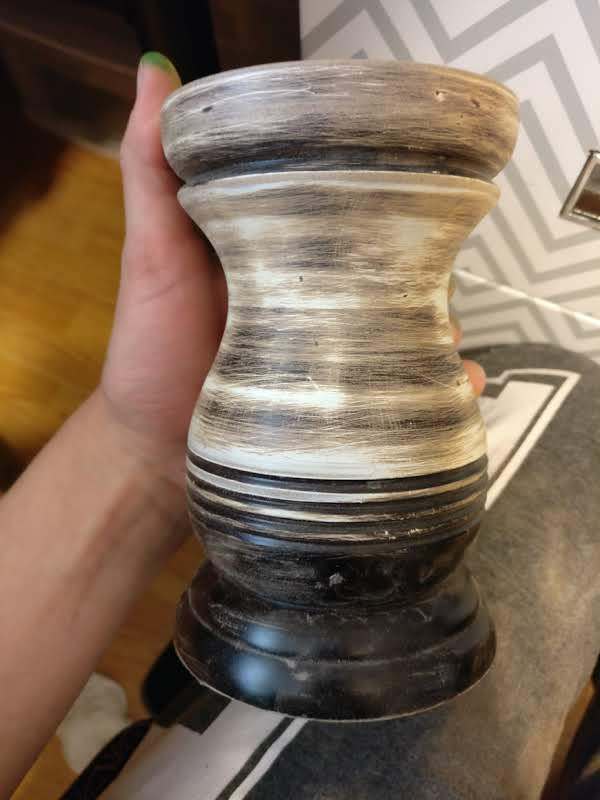 Realistically, they are like $15-30 buckies anywhere I’m looking (chunky candlestick holders, small wooden pedestals, etc. ), and that’s not worth it to me at all. 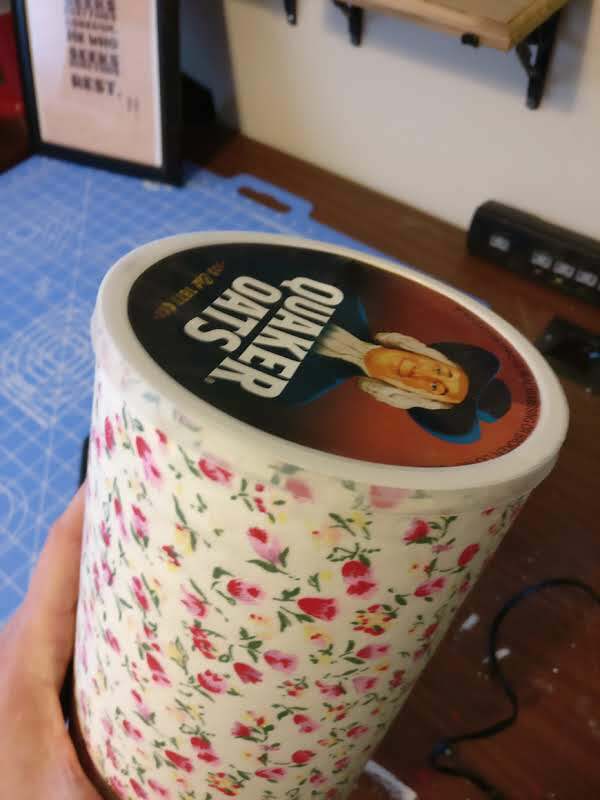 I mean, you can buy one of these oatmeal box headbands holders off of Etsy for like $20-25, so why would you spend more than that on just the pedestal? That’s part of why I’ve put off this project so long. Cause I actually made one of these things about 6 months ago, it just looked weird without the pedestal, aaaaaand I kind of ruined the whole thing with too much lace. So I trashed it. 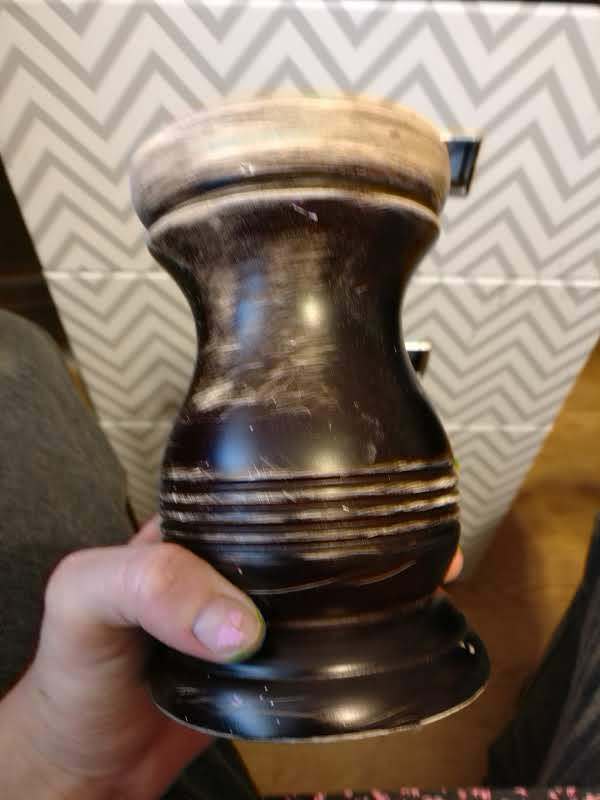 THIS pedestal thingy, I got from a yard sale for…..hmmm…let me remember…. oh yeah. Free. So I took it home. A few days later, during nap time, I decided that I wanted to paint it a creamy white, and distress it. Problem #1: I didn’t have creamy white paint. So, being impatient, I decided that I was going to paint it anyway, but my favorite color of paint ever, some light teal stuff from WalMart. Bimini or Caribbean or something. But, being a little less lazy, I figured I’d better sand it a little first. And I realized… HEY. It’s creamy white underneath. So I ditched the whole blue thing, and decided to just sand it! 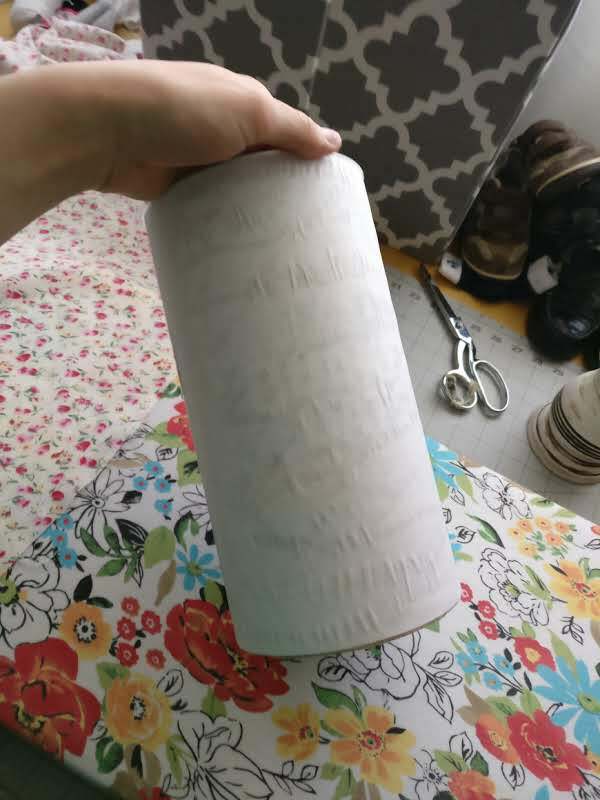 My creamy white, distressed pedestal, with almost no effort. You might not get so lucky, so you might have to actually paint and distress yours. Haha. 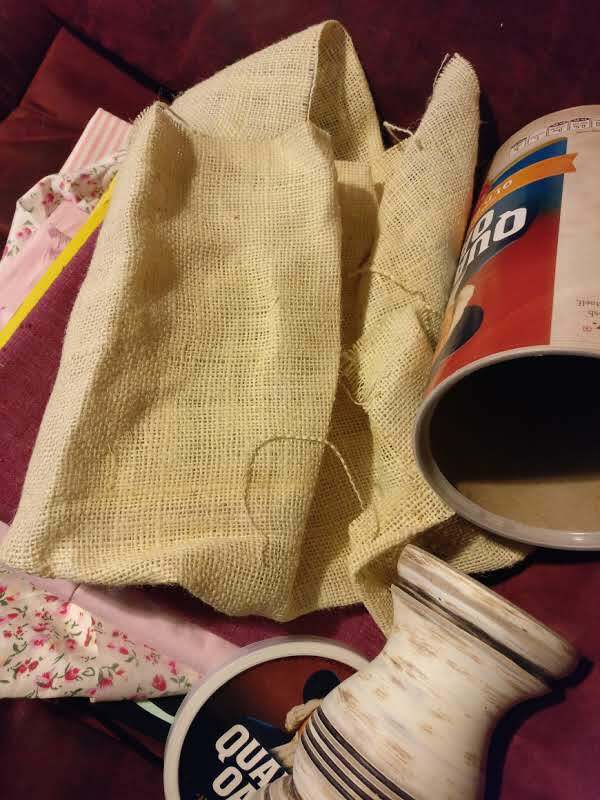 I forgot to take a picture of this, but my fabric was SUPER thin, so the oatmeal box words showed through. Gross. So I made a little paper buffer, by just cutting some white paper and gluing it to the box. It ain’t perfect, but it didn’t need to be. It just needed to work. And it did. 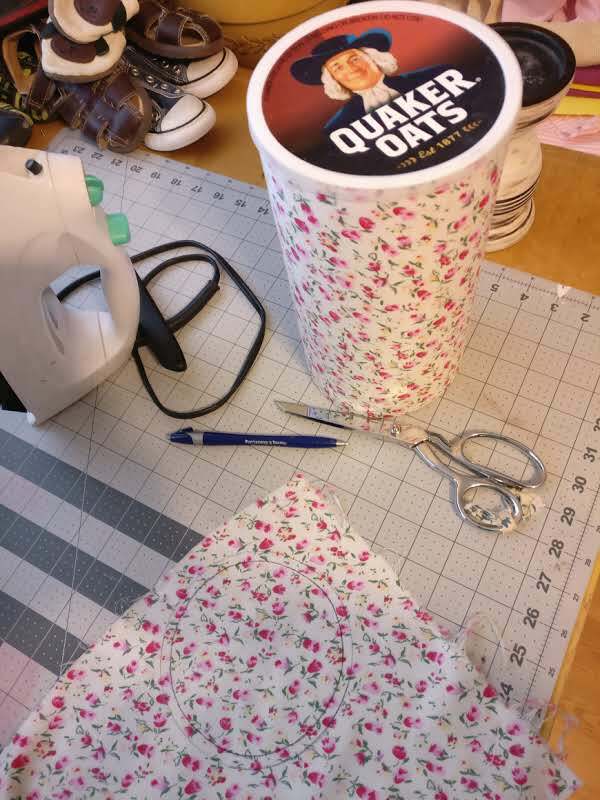 So next, as you can (kind of) see in the above picture (by my bright floral ironing board), I measured and cut out a chunk of fabric for the oatmeal box, and then I ironed it, to get rid of wrinkles. 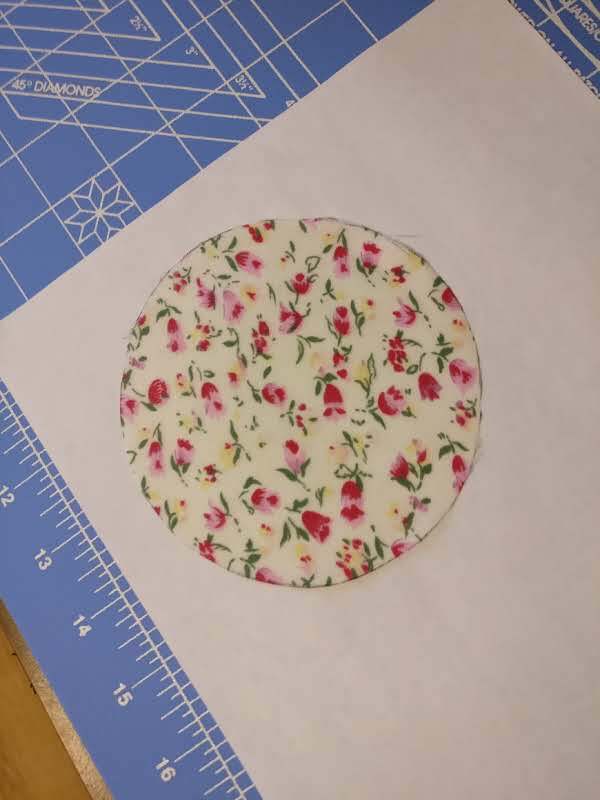 Don’t stress the fabric size too much. Make it a little too big and you can always cut more off. 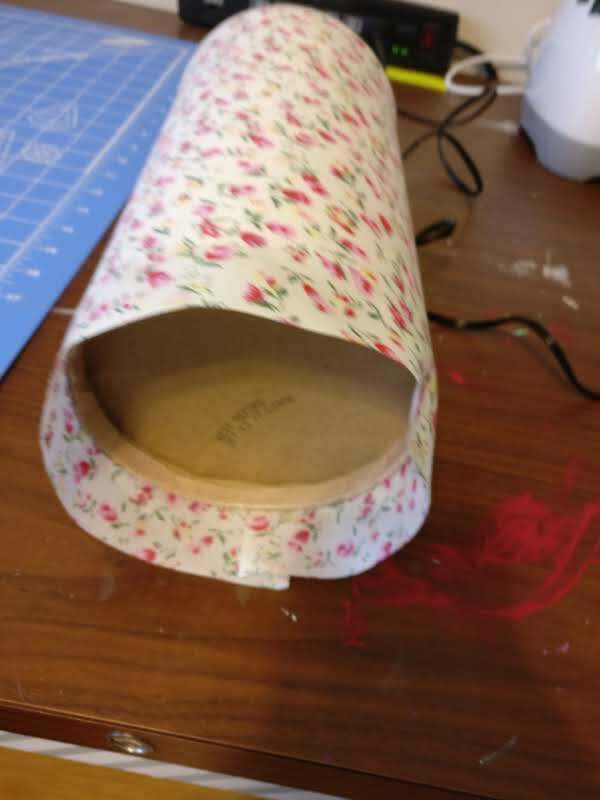 Make sure that you have about an inch of fabric on both the top and the bottom of the box, so that you can wrap it around and have clean edges. 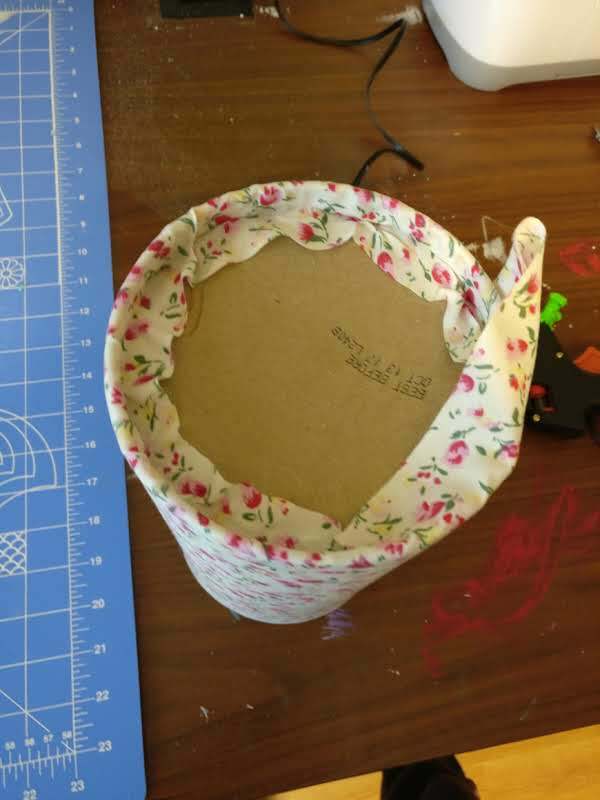 Glue your fabric to your box with a hot glue gun. Make sure you have extra glue on hand, and that the gun is super hot before you start to use it. Also, this is a little painful to your fingers haha, but press down on the glue briefly after each time you glue, so that your fabric doesn’t have all the weird glue bumps underneath. Apply as much or as little glue as you need, taking care to get the edges and avoiding bubbles. 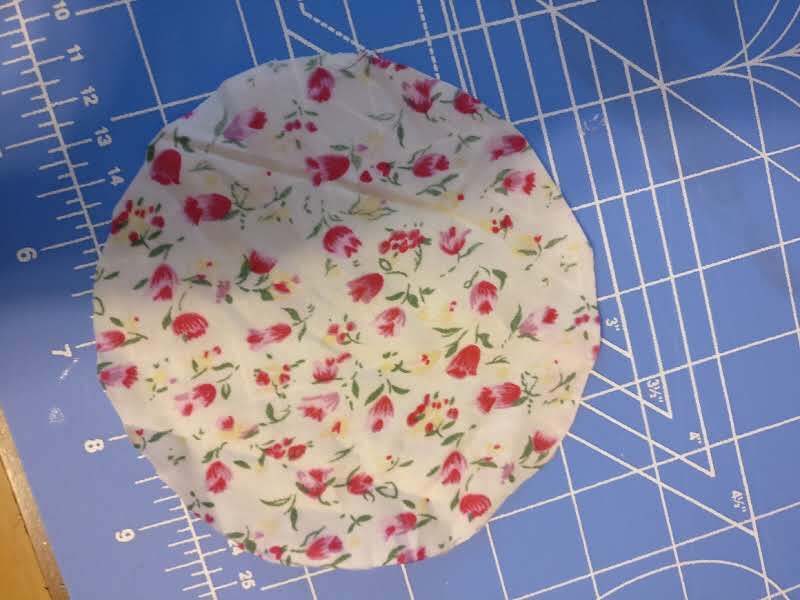 *IMPORTANT: I forgot to take a picture of this, but make a little fold in the fabric end that is going to end up on top, so that you don’t have frayed edges on top, but a crisp, folded-under seam. After you glue around it, it should look something like this. Let’s take a moment to appreciate the blurry picture and the paint on my desk. It doesn’t really matter if it’s perfect, cause 1. it’s the bottom, and 2. we’ll be covering it up. So, set your oatmeal box right-side up on top of another section of fabric, and draw a pencil circle around it. 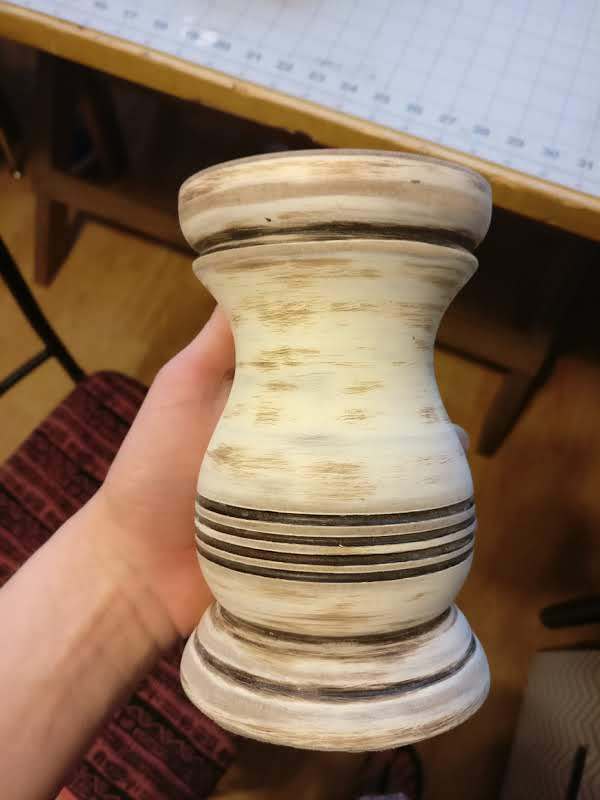 Make sure to draw on the side that isn’t going to be face-up. Iron it, and glue it to the bottom. It’s a little lumpy, but it does the job. You could always stick a circular piece of cardboard between the two layers to avoid lumpiness, but I don’t care that much. Glue the fabric into the inside, pulling tight. 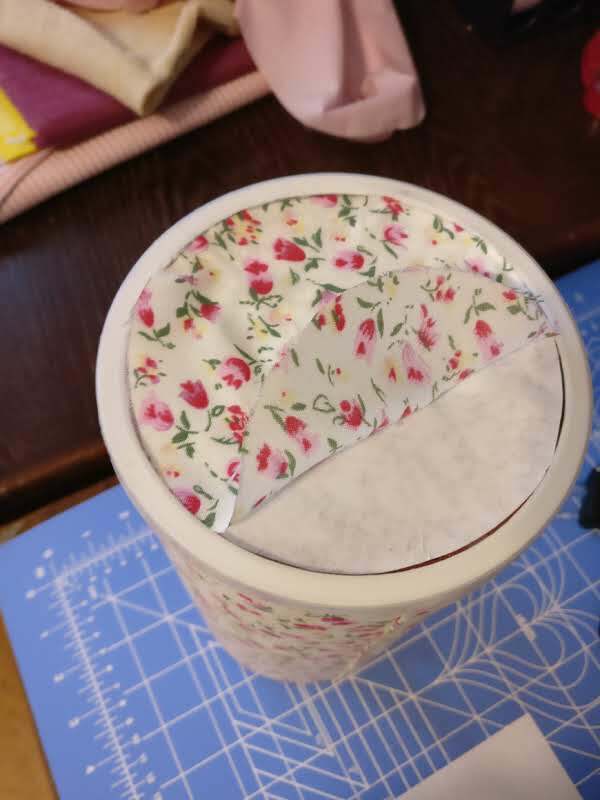 Again, the actual end result doesn’t matter too much, as long as the fabric on the outside of the box stays flat and tight. 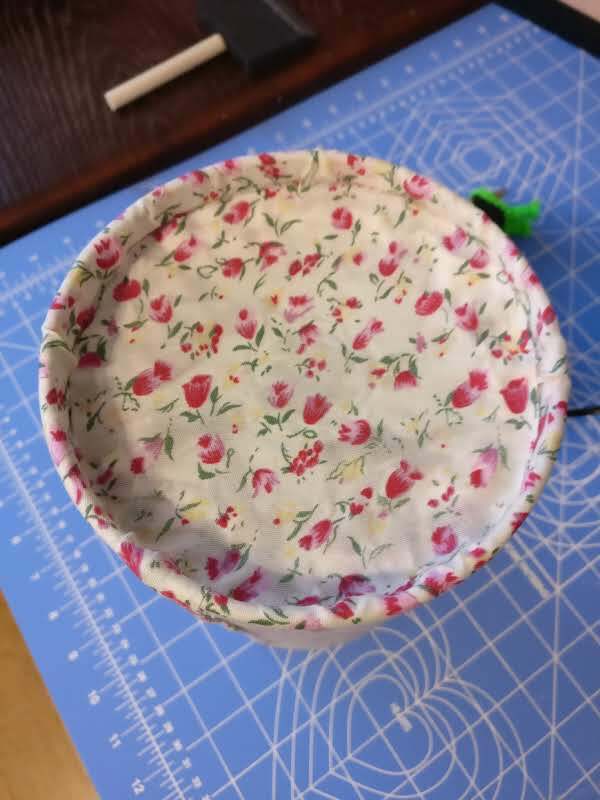 You’ll need to cut another fabric circle for the top of the box. 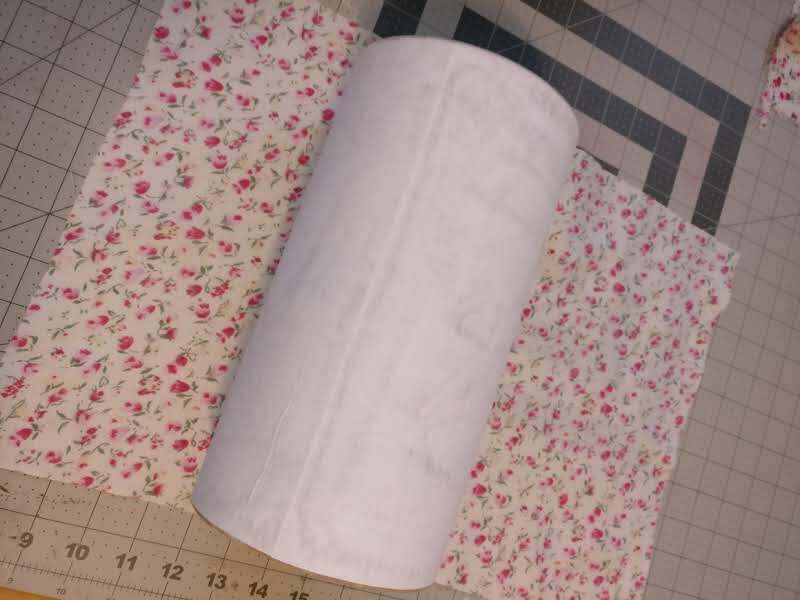 Trace the top of the box onto another chunk of fabric. 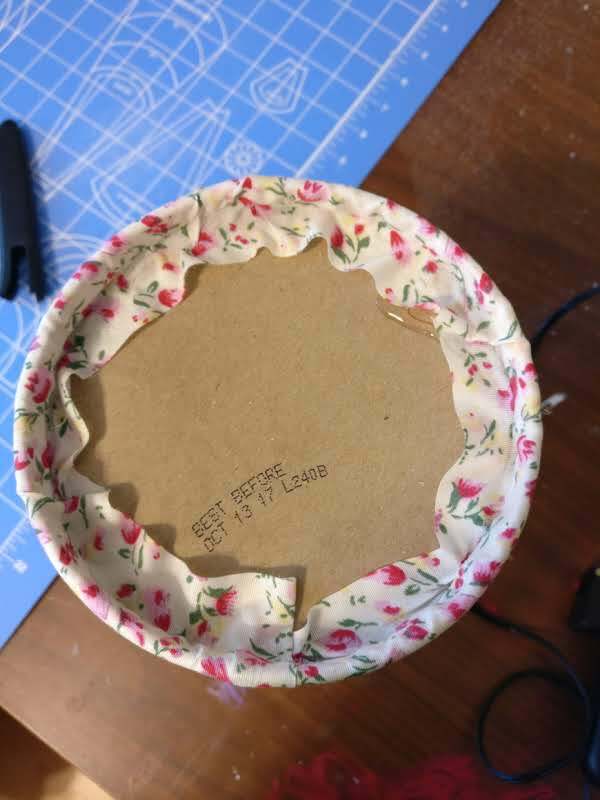 Remember: The picture doesn’t extend to the edge of the lid. 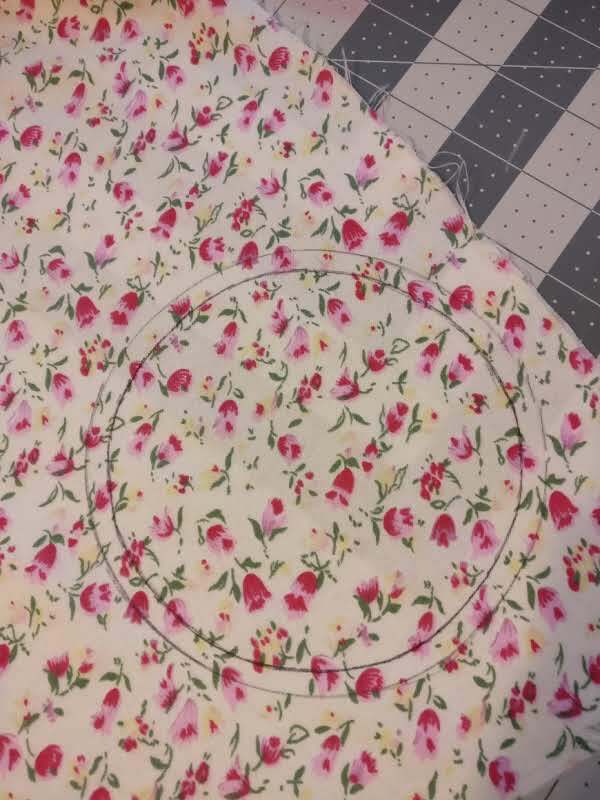 Trace a line (pictured below) that’s about the width of the lid ring, around the inside of your fabric circle. 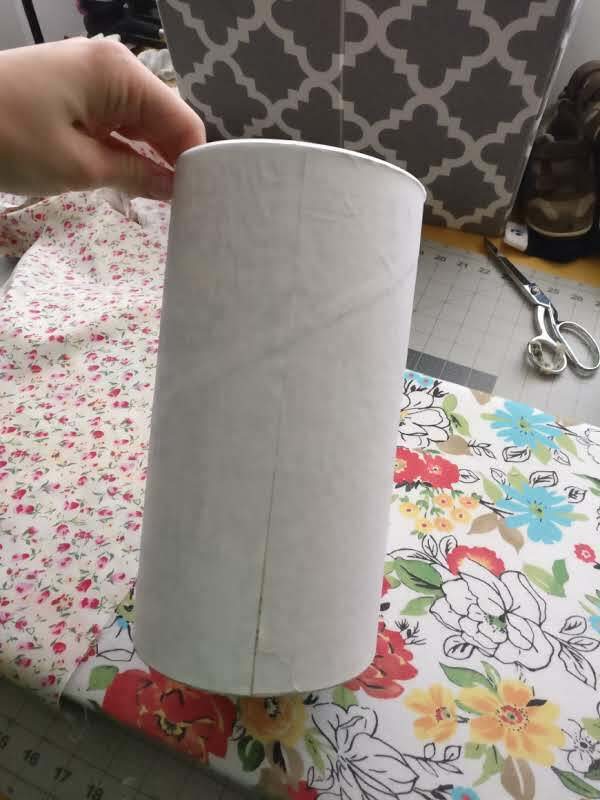 If you needed a piece of paper under your fabric to wrap the box, don’t forget to cut a piece of paper to go under this little fabric circle. 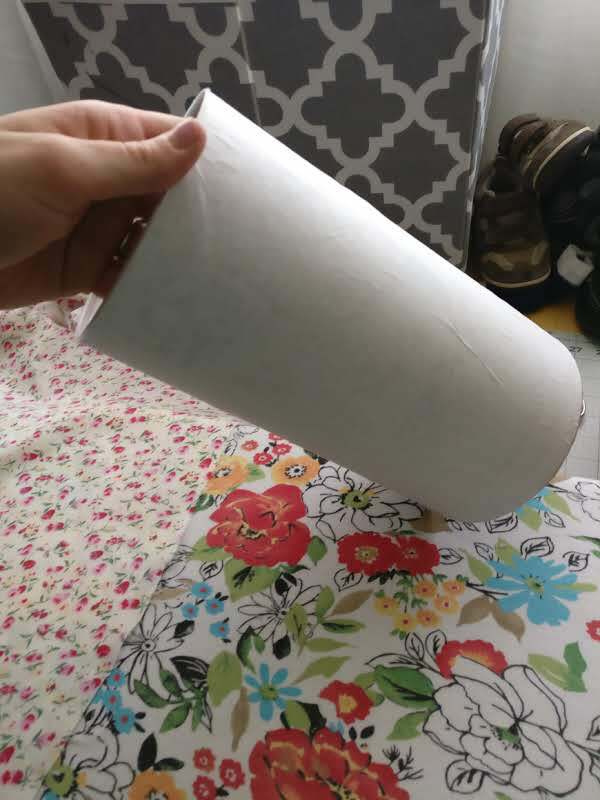 Glue down the paper, and then the fabric. Smooth out lumps and glue as you go. 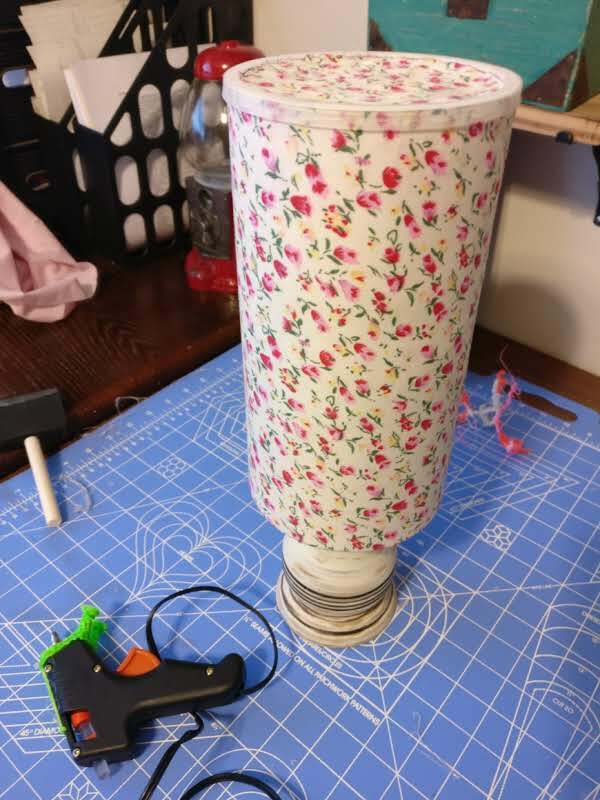 Make sure your glue gun is SUPER hot (aka somehow mine got unplugged right here, and I didn’t realize it, and I had to do this part like 3 times)…. Before you glue, turn your box upside down, put your pedestal where you want it, and lightly draw a pencil line around the outside of it. This way, you don’t have to adjust the gluey pedestal, you just have to line it up inside the pencil circle. Alright. Next. 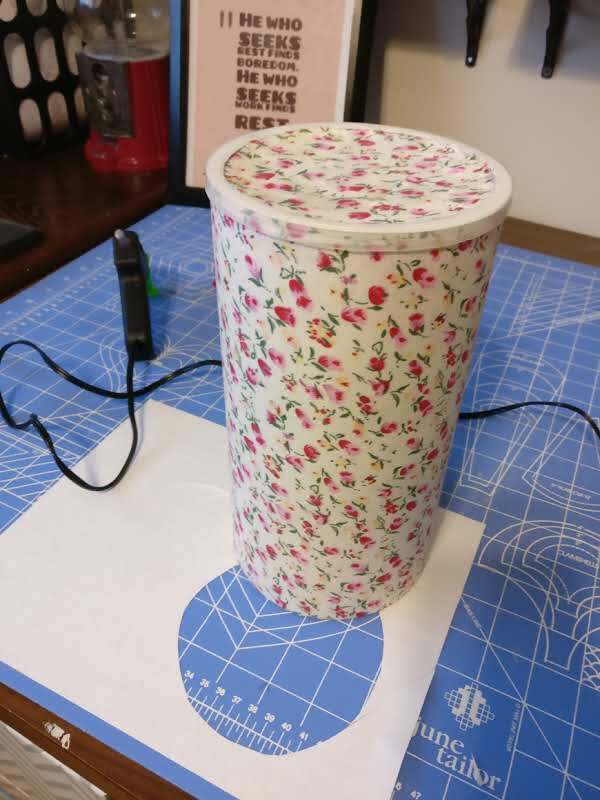 Apply a (kind of) huge amount of hot glue to the top of the pedestal, and press it onto the bottom of the box, lining it up with your pencil outline. Be firm, but don’t push too hard, because you don’t want to bust through the bottom of your box. Woo hoo! It’s (finally) done! 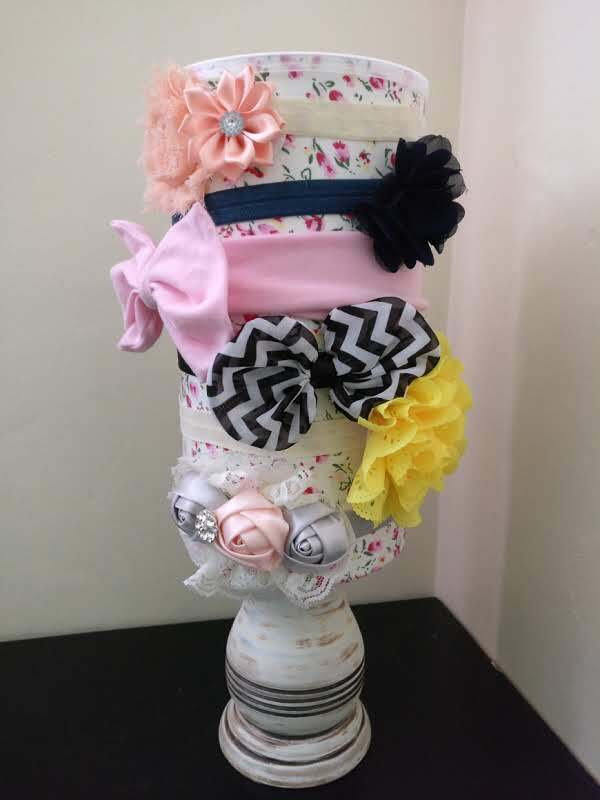 Adorn your new headband holder with millions of bows, and viola! 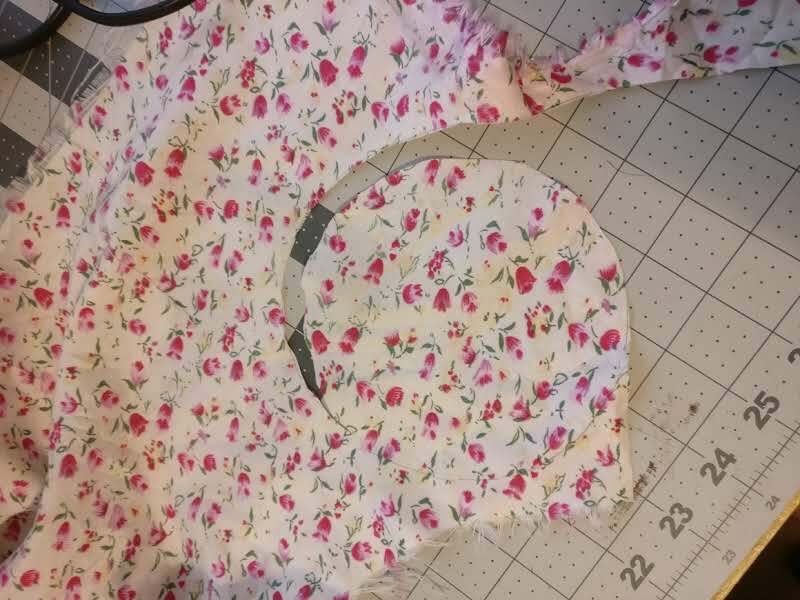 The back isn’t necessarily as pretty, but it’s a great place to clip other little bows…. OR you can throw those little bows INSIDE of the oatmeal box, along with brushes, hair ties, barrettes, etc. 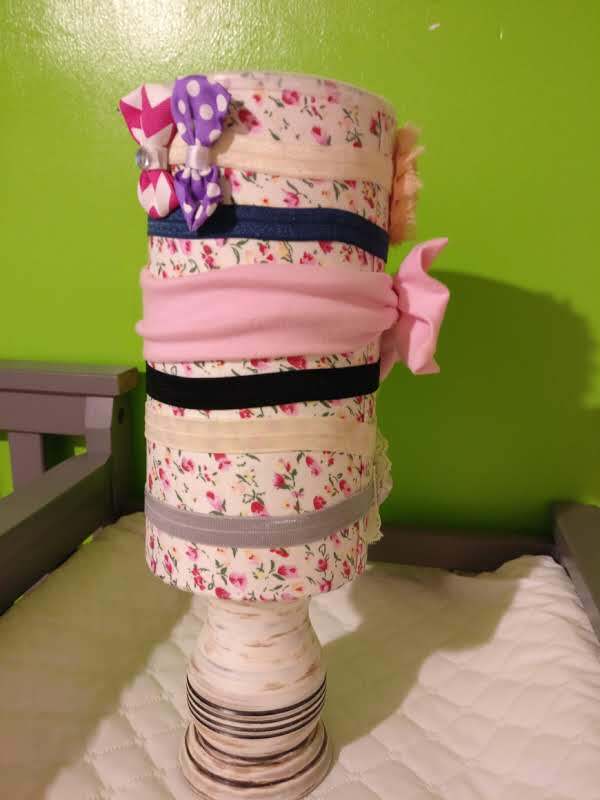 I’m loving my daughter’s cute new headband holder!